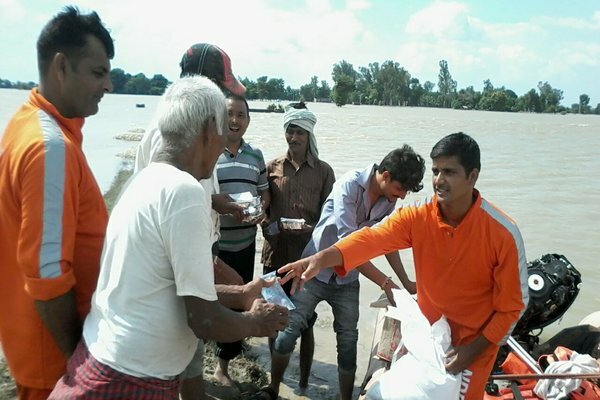 The Akshaya Patra Foundation was part of the relief efforts in flood-hit Gorakhpur city and its neighbouring towns and villages in Uttar Pradesh. Akshaya Patra’s employees from Bengaluru and Lucknow, worked tirelessly on the ground. they have served over one lakh meals to the survivors between August 26 and September 5, 2017. This was made possible with the help of Kitchen on Wheels – a customised mobile vehicle designed by Akshaya Patra. 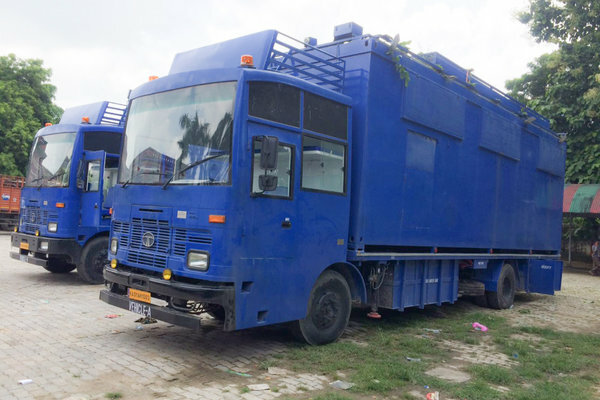 The vehicle was stationed in Gorakhpur since August 26, 2017. It began with serving 5,000 meals on the first day. By September 5, over one lakh meals were distributed in and around the city. The survivors were served Vegetable Pulao, Peas Pulao and Masala Rice and Theplas. The food is packed individually in disposable aluminum foil containers and sent to them. Many villages have submerged in water. The local authorities took help of boats to reach them. The nearest village which is submerged is 9 km away and it takes about 50 minutes to reach there. Apart from these, some more villages like Chauri Chaura, Sahjanwa, Maharajganj, Barhalganj, Campierganj, Sarhari, Nausar have also been affected. The Kitchen on Wheels has been instrumental in helping Akshaya Patra reach survivors. With the help of kitchen staff from Lucknow and Vrindavan kitchens, the Foundation has been supplying freshly-cooked meals prepared in multiple cycles. The transportation time for cooked food has reduced with the help of a mobile kitchen. The kitchen staff worked from 4 am in the morning and the process went on till at 10 pm. The initiative and food quality have been appreciated by the survivors. The increasing number of meals consumed every day are proof of this. As we worked tirelessly to ensure that every survivor gets a full-stomach meal, volunteers from National Cadet Corps, National Service Scheme, local hospitals and hotels, and some localities helped us in the endeavour. The efforts put in by the Akshaya Patra team were appreciated by the District Magistrate.